Zerodha, which claims to be “India’s first discount broker offering the lowest, cheapest brokerage rates in the industry,” is currently down, with “gateway timeout” error greeting users. Zerodha issue back again..lot of people not able to login via Kite. Happy that i moved to another platform two weeks before. As you can see, many complaints indicate the service has been experiencing frequent issues due to which users are quite upset. For its part, the company’s Twitter account has said they are looking into the problem, and it should be fixed soon. Hey, apologies. We are looking into this, will be fixed shortly. In fact, Zerodha is quite actively conveying this to its affected users. Let’s hope the problem gets resolved as soon as possible. Anyway, we are continuously keeping a tab, and will let you know as and when the issue gets fixed or something newsworthy comes to our notice. Many users are now trying to reach the company through its customer care (080 4040 2020). However, not everybody is getting through. Reason is high call volumes that have overwhelmed Zerodha’s customer care staff. Hey, due to high call volumes, the support can be hard to reach but the login issue is being looked into and will be resolved shortly. Looks like competitors are now trying to make the most out of this opportunity. The company has now started informing users about this outage through SMS. 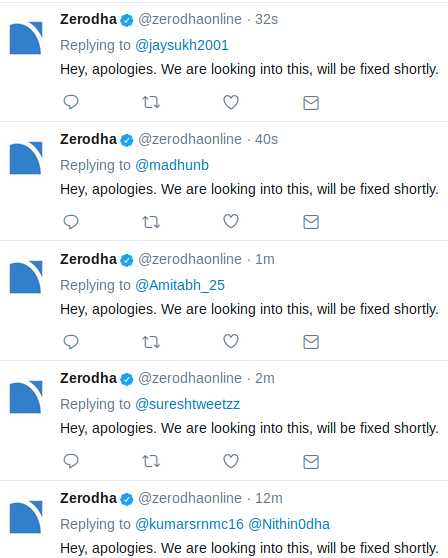 Zerodha says the issue has been resolved. The service is down again. Read more about it here.